Originally featured in the Omaha World-Herald on May 17, 2014. 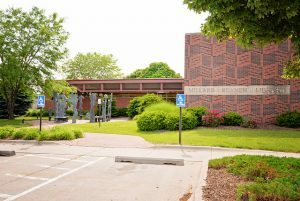 Millard Library was established in 1951 by the Women’s Extension Club of Millard. Its first books were purchased through a community-funded book purchase and a loan from the Nebraska Library Commission. An all-volunteer staff introduced its collection of less than 1,000 books at the Millard Village Hall in 1952, where the library remained until 1963, when it found a room in the new Millard municipal building. Millard Library would move several more times — first to a residential home on South Cedar Street in 1967, and, following Millard’s annexation by Omaha, a shopping center at 132nd and L Streets. As the community continued to grow, the need for a library that provided Millard residents with library services equal to those in the rest of Omaha became clear. Driven by “Omahans for Libraries,” a petition for an $800,000 bond issue was placed on the November 1978 ballot, and its passage ensured funding for a new library building. The current location, 13214 Westwood Lane, opened in March 1981 and boasted nearly 11,000 square feet and 50 parking spaces. It did not take long before this busy location realized that it needed even more space to meet community growth, and, in 1997, Schemmer Associates Inc. designed a modern renovation plan that more than tripled the size of the library. Today, Millard Library remains Omaha Public Library’s busiest branch, lending nearly 25 percent of all materials circulated in the entire system. Millard Library is a hub for community groups using meeting space, as well as individuals and families attending programs for all ages.